Find one of the best views in town at this slick city centre rooftop bar. 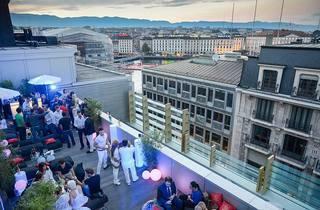 The main reason to visit this rather slick bar is, as you might guess, its rooftop. 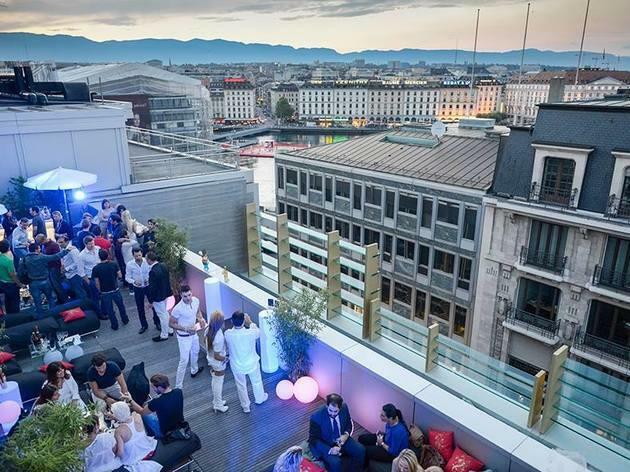 Above a commercial building on Geneva’s posh Rue du Rhône (taking the lift up from the lobby feels like you’re going to a business meeting rather than embarking on a night out), this bar’s outdoor terrace sports a fantastic view over the city, lake and jet d’eau. Inside, it’s less remarkable – the contemporary decor is smart but characterless, but it attracts a steady stream of Geneva’s work-hard, party harder set nonetheless. They come for decent cocktails, a varied food menu (burgers, sushi and much in between) and regular DJ sets that continue into the small hours.